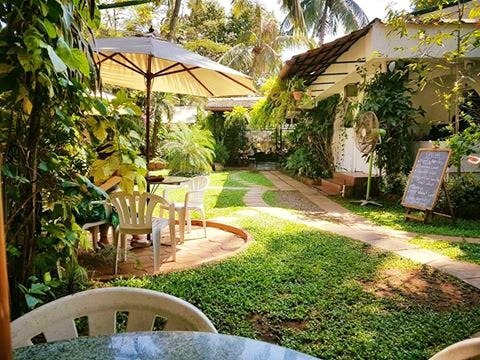 Snuggled into a tiny gate on the footpath on Candolim Road, Café Chocolatti provides you a meditation area of sorts, away from the hustle bustle of the beach and city life. We lost our heart to this cute little cafe the first time we saw it. Anyone and everyone who loves a good meal will enjoy Cafe Chocolatti, which is one of the best breakfast places in North Goa. It is a vast green space that has a distinct European vibe. In fact, the entire architecture is a mix of English and Portuguese designs – a villa with extended rooms that have been converted into the bakery and kitchens, lush green lawns, white and black tiled floors, and pebbled pathways in the garden. And the menu here will have you drooling at the sight of it. The crepes are interesting, and to die for! Their service is warm and quick. The staff is knowledgeable. The entire experience feels homely- as if you’re sitting in your own backyard and enjoying a royal meal. The cafe opens at 9am, is shut on Sundays, and has ample parking space. Don’t forget to carry your favorite book along, just in case. All that you need is some good company, or maybe just you and your thoughts! They also shut down for the monsoon months from June till September. The next time you’re in Goa, peace out at Cafe Chocolatti while gorging on their amazing food and soacking in your surroundings.